After following a particular circuit long enough, strong trainer/jockey combinations present themselves. Trainers often give their best mounts to a jockey with whom they have a good rapport, and who they trust to ride the horse exactly the way they ought to be ridden. However, a strong trainer/jockey combination is not a magic panacea, nor a substitute for rigorous handicapping. Instead, it is a factor to consider, and a reason to delve deeper into whether a particular horse might be an overlay or an underlay. Sometimes, knowing a trainer/jockey pair can be the key to finding a value play. A perfect example of this is Flower Spell in the Chicago Handicap, (GIII) June 28, 2014 at Arlington Park. The race is a seven-furlong affair for fillies and mares ages three and up. Looking at her past performance lines alone, Flower Spell looked like a marginal candidate. She had seen significant success in five and six furlong sprints in the area, including an overnight stakes win last year at six furlongs over the Arlington poly. Her only graded stakes attempt had been in last year’s Chicago Handicap, in which she bolted to the early lead but faltered in the final furlong. Since then she had shown a valuable ability to rate, but had not again ventured past six furlongs. The only other time she had even tried longer than six furlongs was a flat effort at a mile while she was still a maiden. A strong trainer/jockey combination is not a magic panacea, nor a substitute for rigorous handicapping. Her trainer and her jockey made her appealing in her second Chicago Handicap attempt, despite the potentially precarious stretch-out. Flower Spell is trained by Ingrid Mason, who has been sitting at second in the Arlington trainer standings for much of the meet. Out of Flower Spell’s six wins going into that race, four of them had been with Homeister aboard, and she had never finished worse than second in seven starts with Homeister. Their filly was in peak physical condition for an allowance win two weeks before, and looked equally sharp on Chicago Handicap day. Beyond their work with this one horse, Mason and Homeister had been generally strong as a unit. Entering the race they had won fourteen of their last thirty-one starts together, and been in the money with twenty-four of them. Their strength combined with Flower Spell’s improving recent form made her worth considering for a price. Anything below 5/1 would have been questionable at best given the questions on distance, but bettors were far more interested in Disco Barbie, Cozze Up Lady, Eden Prairie, and My Option. Flower Spell went off as the 8/1 fifth choice. This made her playable as a win bet, and a must-use in exotics. Those who had faith in what Mason and Homeister could do with Flower Spell were rewarded. The field ceded the lone early speed to Flower Spell, and she set far more reasonable fractions than last year. Down the stretch she held off everyone… but My Option. She paid $8.00 to place, and the $2 exacta with Flower Spell below paid $104.00. Given the distance and her limited graded stakes experience, it would have been difficult to identify Flower Spell as a legitimate candidate if not for the trainer and jockey. It was also probably better than his backers would have gotten if Drama Coach hadn’t had an “I’m a Mason/Homeister on a win streak! Bet me!” sign hanging over his head. Other times, a horse with an extremely strong trainer/jockey combination may end up being a significant underlay. This can be somewhat harder to identify, since often horses with top trainer/jockey combinations are well spotted: after all, they don’t rise to the top for naught. However, identifying vulnerable horses with a top trainer/jockey combination can lead you away from chalk and toward more valuable options. For an example, consider Drama Coach in the third race at Arlington on June 13. This race was a five and a half furlong turf dash, at the $50,000 beaten claiming level. Drama Coach is trained by Ingrid Mason and ridden by Rosemary Homeister, Jr: the same rock-solid trainer/jockey combination behind Flower Spell. Entering into that race, the combination was strong enough to merit particular consideration on the trainer/jockey factor: they had won 11 of 27 races in the previous 60 days, and been in the money 20 of those times, for a +1.31 ROI. Drama Coach won his last race by ten lengths, firing a 94 Brisnet speed in that win. That was a higher figure than any other horse in the field had mustered in their entire career. With such a hot trainer and jockey behind him, Drama Coach sounded live. The public bet him down accordingly, sending him off at even money. This was an example when doing further analysis on the horse himself revealed that even money was a terrible bet to take. His last win may have looked impressive, but it was against easier company: $25,000 beaten. It was also on the all-weather, not the turf. That gaudy speed figure was such a jump from her recent previous form that he was a serious bounce risk. The last time he had set a career high, he regressed by nine points. Assuming a bounce in that range again, it wouldn’t put Drama Coach out of the running, but wouldn’t make him a standout either. The surface was another question. Drama Coach’s three wins had all come on other surfaces. He had tried turf dashes four times, all at similar distances, and never mustered better than third. Finally, a plum pace setup was unlikely. Drama Coach liked to be on or near the early lead, but so did J. Z.’s Crafty Boy, Mongol Bull, Malachite, and even Heart Doctor. For a six-horse field, that suggested there would be at least some fight for the lead. None of this is to say that it was a bad idea to try Drama Coach here: he had won his last two with Homeister aboard, and Mason had every reason to try him against something tougher than $25,000 company. As much as Drama Coach had going for him, though, he had enough going against him that even money required the savvy bettor to look elsewhere. As it happened, it was a speed horse that took the race. However, it was Mongol Bull, one of the 5/1 shots. That price was fair, if not an overlay. He had finished second by just a head at a turf sprint at this level last out. In three turf sprint runs, he had won once and finished second twice — never finishing more than half a length back. His one win in a turf dash had been on yielding turf, and the course was again yielding that day. He was no sure thing to win with all of the early speed in the race, in addition to the fact that trainer Bradlee Rainwater had not yet won in nine starts that Arlington meet. However, based on his class level and his proven ability to sprint on yielding turf, 5/1 was a great price. It was also probably better than his backers would have gotten if Drama Coach hadn’t had an “I’m a Mason/Homeister on a win streak! Bet me!” sign hanging over his head. In short, it pays to pay attention to trainer/jockey combinations, and to continue analysis of a race after identifying a horse with an interesting one. Even the strongest pair does not make a horse automatically worth betting. However, they mean a horse merits further thought. Sometimes strong combinations can indicate an overlay. Other times, they can make a different horse an overlay by making their horse an underlay. Both situations create value for anyone willing to look. 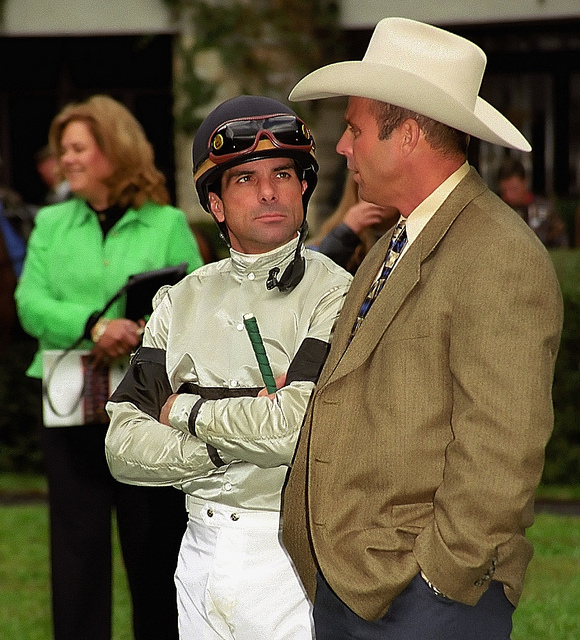 Image: David Ohmer, “Lexington Kentucky – Keeneland Jockey “Eddie Martin Jr. – Strategizing.” Creative Commons 2.0 license. Copyright 2007.